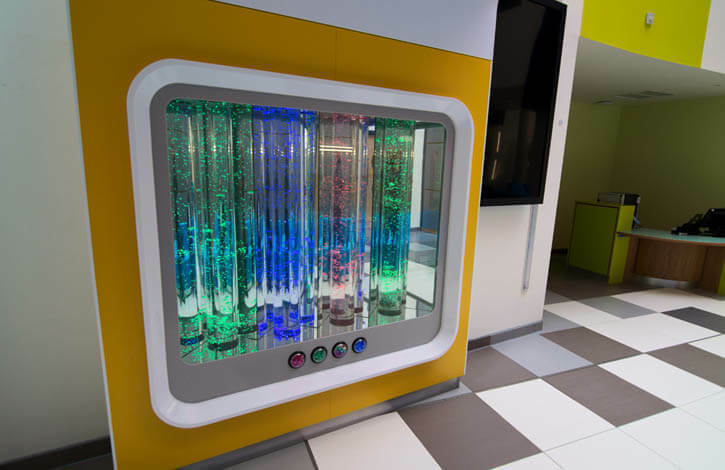 Apollo Creative have supplied four DMX bubble tubes to form part of an exciting set of new sensory activities that will put a smile on any hospital patient and visitor to the new South Glasgow University Hospital and Royal Hospital For Sick Children. In the interactive sensory experience, designed and installed by Paragon Creative along with the main contractor Glasgow Science Centre, the bubble tubes are housed in a unit that features a concertina mirror which creates an infinity effect to enhance the bubbles and lighting patterns. A main DMX controller sits at the heart of the bubble tubes and links all of them together. 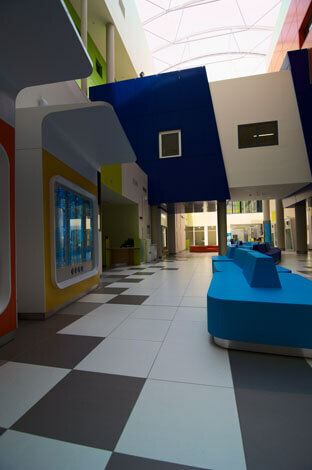 Paragon Creative were then able to pre-programme sequences that would change colours of the tubes as well as the air valve to affect the flow of bubbles. Through the use of four switches a variety of effects are at the control of the user, from calming and warming effects through to a funky disco! This sensory experience is just one of many that were created by Paragon Creative including a series of complex ‘ball runs’ as well as space themed touch activated sensory wall.